What Size Wheels Should I Purchase? Adjusts to fit tripods with tip-to-tip distance from 33" to 43"
See doorway measurements for more dimensions. Tip receptacle is 2-1/4" I.D. You might also be interested in our "Speed Dial" drill adapter for quickly adjusting leveling screws on any Wheeley Bars. ** Your CGE mount may require Large Size Universal Wheeley Bars depending on the tip-to-tip distance. It may also require the 10" Pneumatic Large Wheel Upgrade (to lower the mount to an acceptable height). Do not use the standard Medium Wheeley Bars for 12" or larger SCTs (even if the mount is listed above) as these telescopes are too heavy for this product. Check out the HEAVY DUTY Version below. The picture at left shows the Medium Size Universal Wheeley Bars with the standard 2-3/8" wheels. 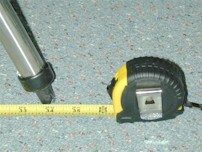 The optional 5" Large Wheels are also shown for size comparison. The HEAVY DUTY Version is designed for heavier equipment with the same footprint as the standard Medium Wheeley Bars and the heavier construction of the Large Wheeley Bars. In other words, they are like Large Size Wheeley Bars with short legs (the same length as the Medium Size Wheeley Bars). Because of the increased weight with the narrow width, there will be a greater risk due to the high center of gravity. The equipment will need to be strapped down to the Wheeley Bars and, as with all Wheeley Bars, JMI will not be responsible for equipment tipping over. Tip receptacle is 2-3/4" I.D. 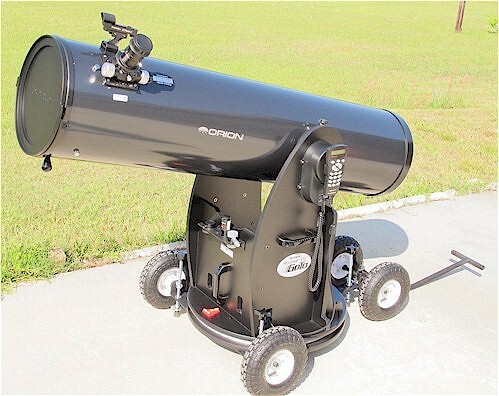 * When ordering, please place a note in the shopping cart Comments area identifying the specific telescope / mount manufacturer and model. The picture (left) shows the optional 5" Large Wheels Upgrade. 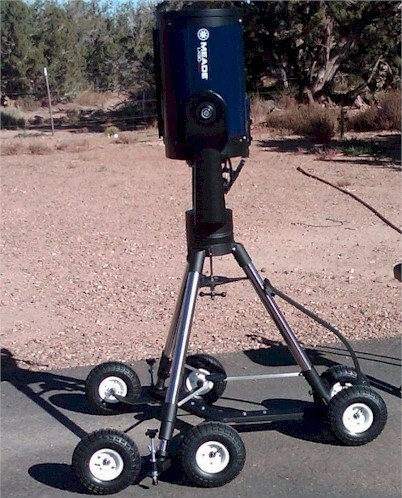 ATS Portable Pier mount (may require custom product if tip-to-tip distance is less than range shown below); Celestron C14, CGE 925** / 1100** / 1400***, CI-700 mount; Meade LX90GPS 12", LX200-ACF 12" / 14", LX200 12" (GPS and non-GPS), LX200GPS 14", LX200R 12" / 14", LXD700 / 750 mounts, RCX400 10" / 12" / 14"; Particle Wave Technologies Monolith Pier mount. See Note Below / Customers easily mistake Large vs AP/G11/Etc (Hidden). 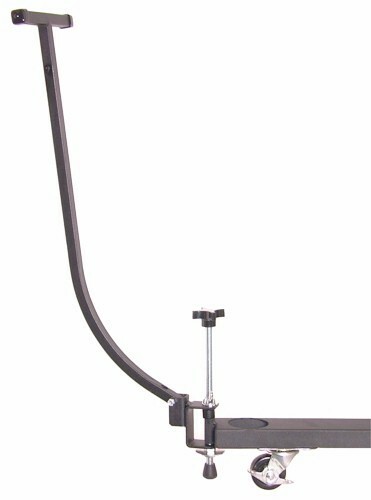 Adjusts to fit tripods with tip-to-tip distance from 48" to 56"
** Your CGE mount may require Medium Size Universal Wheeley Bars depending on the tip-to-tip distance. It may also require the 10" Pneumatic Large Wheel Upgrade (to lower the mount to an acceptable height). *** The CGE 1400 mount may require Custom Size Universal Wheeley Bars depending on the tip-to-tip distance. It may also require the 10" Pneumatic Large Wheel Upgrade (to lower the mount to an acceptable height). NOTE The picture (at left) shows the Large-size Universal Wheeley Bars with the discontinued 4" Large Wheels. The optional 5" wheels are still available. Notice the extra bracing between the legs of the Wheeley Bars. This picture shows customer Gary Stacy's Meade LX 850 14" on JMI's Large-size Universal Wheeley Bars. Note the Bungee Cords holding the tripod on the Wheeley Bars. This is something JMI recommends. 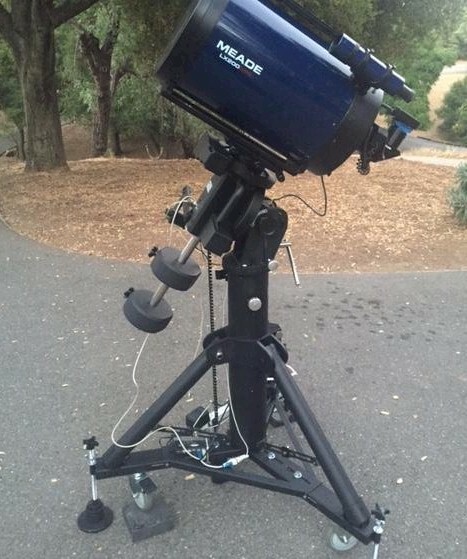 This customer picture from Gary Stacy shows Large-size Universal Wheeley Bars carrying a Meade LX 850 14" f/8 OTA with an Orion ED80T CF Triplet APO on top. "It also has two MallinCam cameras and a filter wheel and a lot of mounting hardware. ...There is a lot of weight. I guess 300 pounds or a little more. The 5" wheels roll smooth." 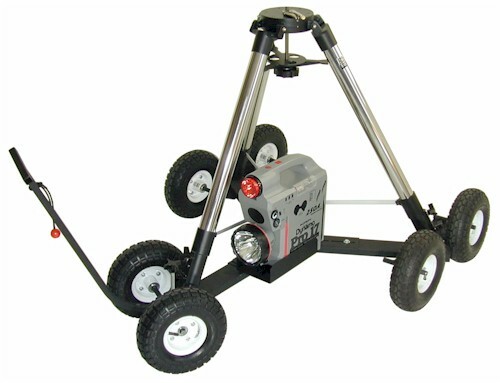 Includes six 10" all-terrain pneumatic wheels, a tow handle and 5/8" diameter leveling screws. 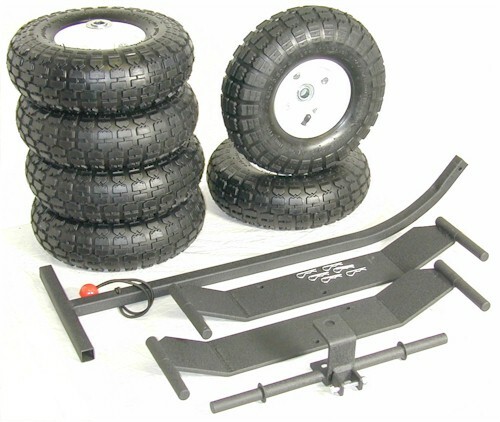 This product is essentially a "Beefed Up" Large Size Universal Wheeley Bars* with the 10" Pneumatic Large Wheels (Tow Handle included). 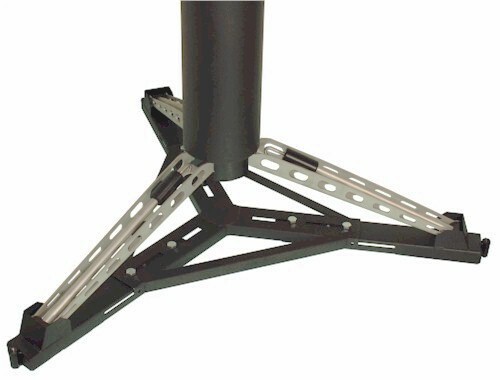 * Each leg is extended by 2" to move the leveling screws out from the tripod legs and the leveling screws have a larger 5/8" diameter thread. This picture shows the Extra Large Size Universal Wheeley Bars, with the Motor Upgrade (except included Battery Pack Holder), in pieces and ready to be shipped. 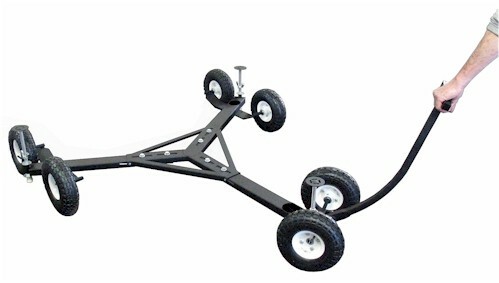 Adjusts to fit tripods with tip-to-tip distance from 53.5" to 59.5"
Includes eight 10" all-terrain pneumatic wheels, steering/tow handle and motor. 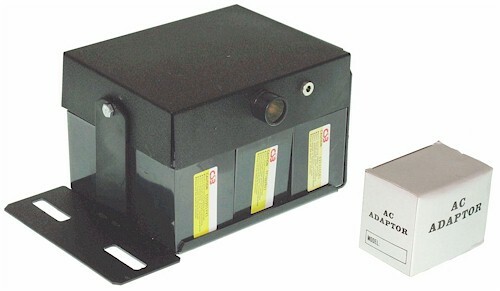 A 12 volt power supply is required (not included, see our 21 Ah Power PAC battery pack). 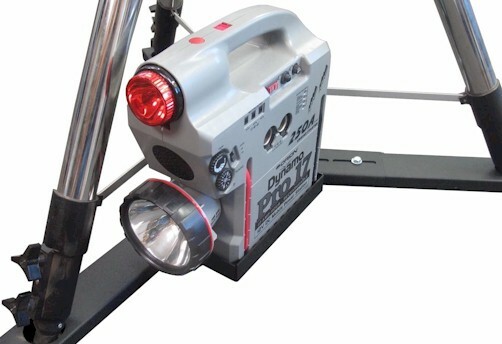 See our 21 Ah Power PAC battery pack pictured here. Customized universal model for Astro-Physics pier mounts (same as Large Size Universal except for tip receptacles). Tip receptacle is 1" I.D. 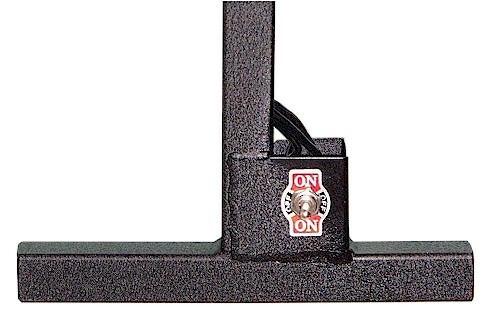 NOTE For a 6" Eagle Adjustable Folding Pier Mount use HEAVY-DUTY Medium Size Wheeley Bars. The ONLY difference between the Large Size Universal Wheeley Bars and the Astro-Physics Wheeley Bars is the style of the tip receptacle at the end of the legs. Tip receptacle is 3-1/2" I.D. 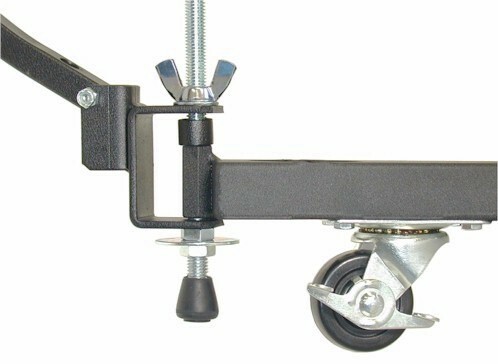 ** When ordering, please place a note in the shopping cart Comments area specifying tripod tip-to-tip distance with legs fully retracted or, alternately, at the preferred viewing height less the height of the Wheeley Bars. Also specify leg/feet diameter and tip style. 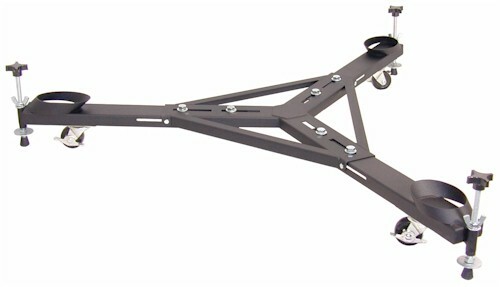 Mountain Instruments MI-8P pier mount; Other mounts with tip-to-tip distance between 43" and 48". ** When ordering, please place a note in the shopping cart Comments area specifying tripod tip-to-tip distance with legs fully retracted or, alternately, at the preferred viewing height less the height of the Wheeley Bars. Also specify leg/feet diameter and tip style. Before ordering Custom Wheeley Bars, please call for availability. These custom Wheeley Bars made for Chris Stephan hold his 1961 8-inch f/8 Criterion Deluxe Dynascope. 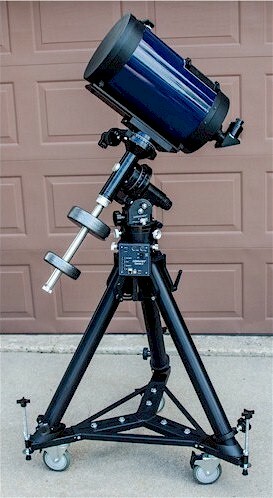 These custom Wheeley Bars made for Sam Hadel hold his Meade LX850 mount with an Explorer Scientific refractor. The tripod and Wheeley Bars are set at a 70" tip-to-tip distance. Notice the extra leveling screws! 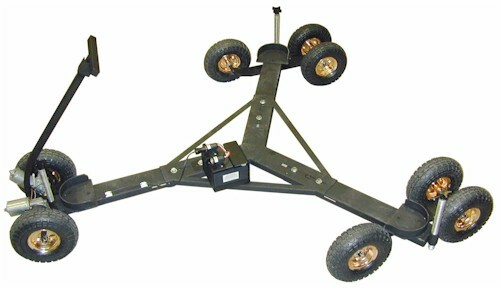 This image shows a set of custom Wheeley Bars for a Panther TTS-160 pier mount (trackthestars.com). 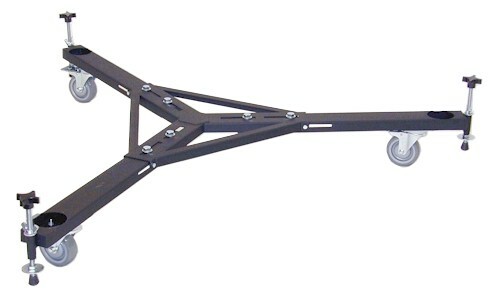 This image shows a close-up view of one leg of the above custom Wheeley Bars. Wheeley Bars for Meade LightBridge 8"
Width (at rear wheels) is 27"
Length (front to back including wheels) is 37"
NOTE Due to variations in foot placement, one or more of the feet on the base of your scope may need to be moved in order for this scope to fit the Wheeley Bars. 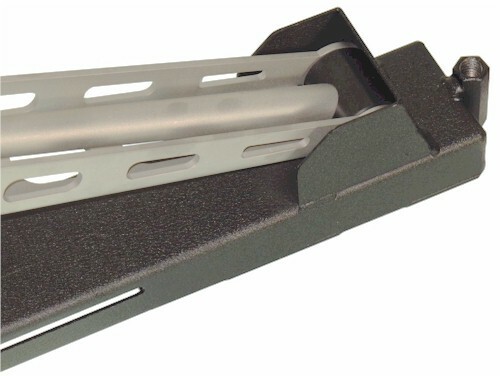 Wheeley Bars for Meade LightBridge 12"
Slotted foot receptacle is 1-3/16" I.D. Width (at rear wheels) is 32"
Length (front tire to back tire) is 41"
NOTE Due to variations in foot placement on the 10" LightBridge, one or more of the feet on the base of the scope may need to be moved in order for this scope to fit the Wheeley Bars. NOTE: Some modification is necessary to make the Go-To scopes fit these Wheeley Bars due to placement of four nuts on the azimuth bolt mounting plate (bottom of scope/ground board). The Apertura AD12 on Wheeley Bars. Picture provided by customer Paul Radzilowski. These are the parts for the Wheeley Bars for the Meade LightBridge 12". Assembly is easy. Wheeley Bars for Meade LightBridge 16"
NOTE: The ground board feet may need to be moved. 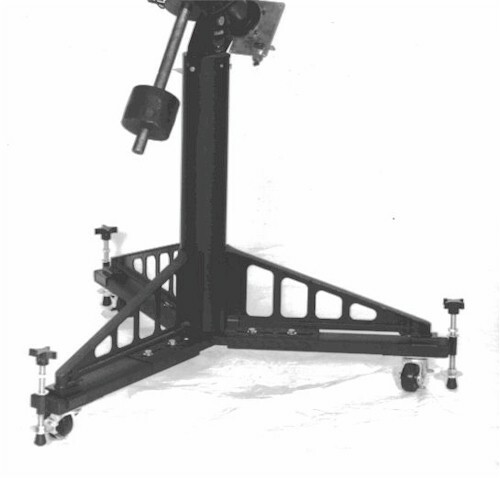 Width (at rear wheels) is 33"
Length (front to back including wheels) is 53"
Due to variations in foot placement, one or more of the three feet on the base of your scope may need to be moved in order for this scope to fit the Wheeley Bars. 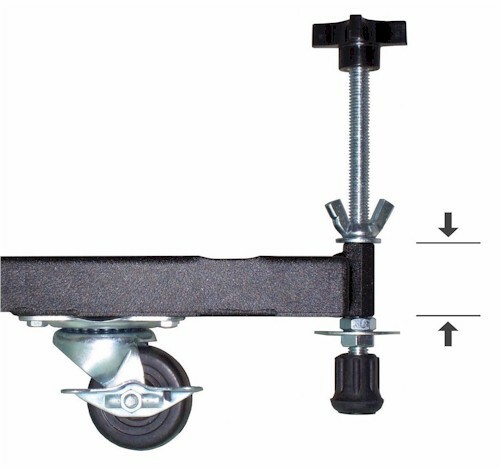 Fully locking 5" diameter polyurethane wheels to replace the standard 2-3/8" hard-rubber wheels on Universal-Style Wheeley Bars (both standard and custom versions). With these wheels, the Wheeley Bars will raise the mount 6-3/8" off the ground. For wheel size recommendations, please see What Size Wheels Should I Purchase? * If you simply wish to purchase the Wheeley bars with 5" wheels rather than 2-3/8" wheels, pick the "upgrade at time of purchase" option (part number TPWLWUPG). This price is cheaper because the small wheels are essential "traded in" toward the price of the larger wheels. The picture at left shows a set of Universal Wheeley Bars with the standard 2-3/8" wheels installed and a set of 5" Large Wheels off to the side. 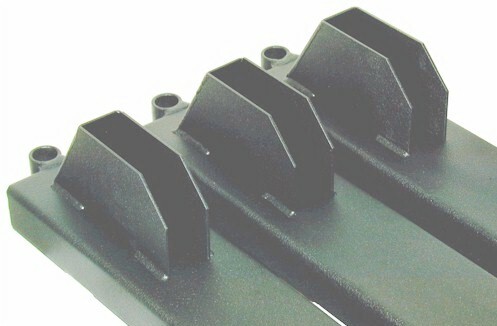 This set of Wheeley Bars are an old version designed for a Losmandy G11 mount. 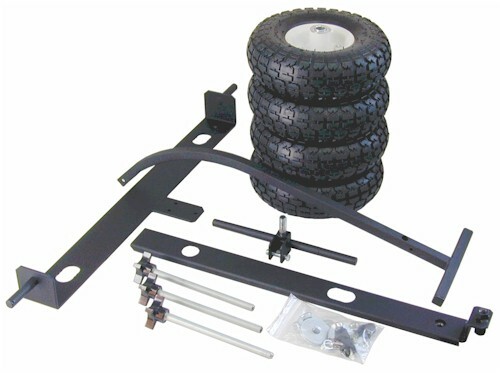 Add six large 10" all-terrain pneumatic wheels and a tow handle to replace the standard 2-3/8" hard-rubber wheels on Universal-Style Wheeley Bars. A dual inboard wheel design on the rear wheels maintains a narrow profile. With these wheels, the Wheeley Bars will raise the mount approximately 3-1/4" off the ground. 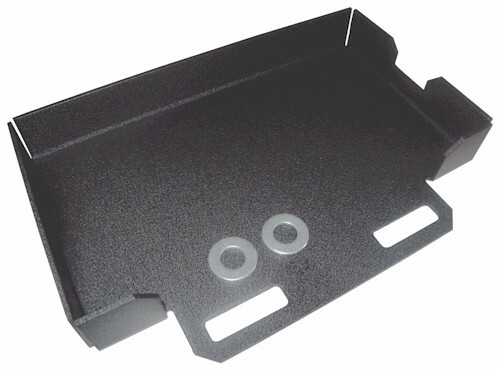 An optional Battery Pack Holder is available (included with Motor Upgrade). * If you simply wish to purchase the Wheeley Bars with 10" wheels rather than 2-3/8" wheels, pick the "upgrade at time of purchase" option (part number TPW10UPG). This price is cheaper because the small wheels are essentially "traded in" toward the price of the larger wheels. The first picture at left is of JMI Universal Wheeley Bars with the prototype 10" Pneumatic Large Wheel Upgrade, optional Battery Pack Holder and an Orion Dynamo Pro 17 Power Station (not available from JMI, see the Cen-Tech 12v 17Ah Power Pack). The dual inboard wheels on each rear "axle" help keep a narrow profile. The product also includes a pull handle. The second pictures shows what is included in the 10" Pneumatic Large Wheel Upgrade as a separate purchase. PRE-OCTOBER 2013 Large or Heavy Duty Medium Wheeley Bars? You can verify the need for the Long Mounting Bracket by measuring the Threaded Leveling Screw Guide (Long Nut) which holds the leveling screw (see picture below). Units built before October 2013 used a longer guide/nut which measures about 2-3/8" and requires the Long Mounting Bracket. Current guide/nut length (which does NOT require the longer bracket) is about 1-5/8". Add a Motor to any Universal-Style Wheeley Bars to create THE RIDE. A Battery Pack Holder is included. 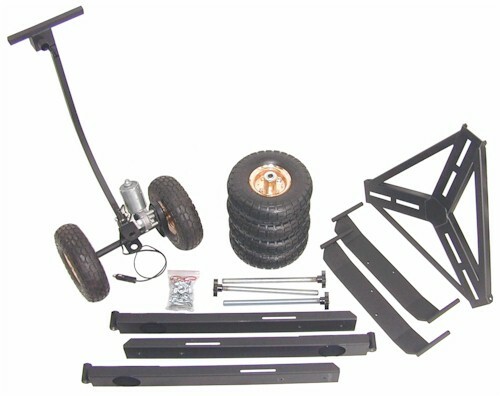 The Motor Upgrade requires Universal-Style Wheeley Bars with the 10" Large Wheel Upgrade and a 12 volt power source. We recommend a 17 amp-hour or greater power source. Try the Cen-Tech 12v 17Ah Power Pack. 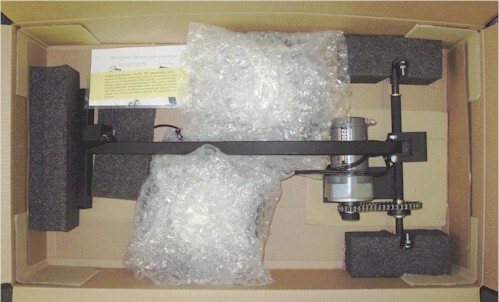 This picture shows the Motor Upgrade installed and the assembly placed in a shipping box. 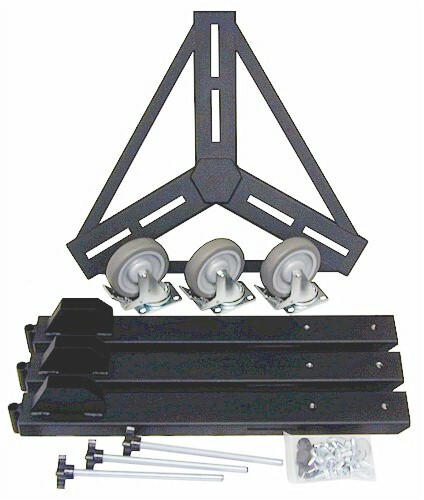 Add a Battery Pack Holder to Medium and Large Universal-Style Wheeley Bars for battery pack products. It will hold a battery up to 5-1/2" x 10" in size. In this picture the Battery Pack Holder is installed and is holding a Battery Pack. 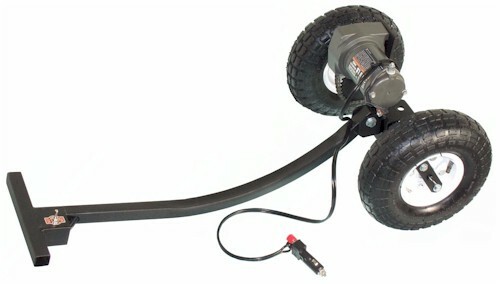 The 10" Pneumatic Large Wheels already include the Tow Handle. This close-up shows how the handle is attached. The Threaded Leveling Screw Guide is welded to the end of a Wheeley Bar leg. Portable drill adapter helps quickly and easily adjust (raise or lower) leveling screws on any Universal-Style Wheeley Bars. Cuts assembly time by 50% or more! 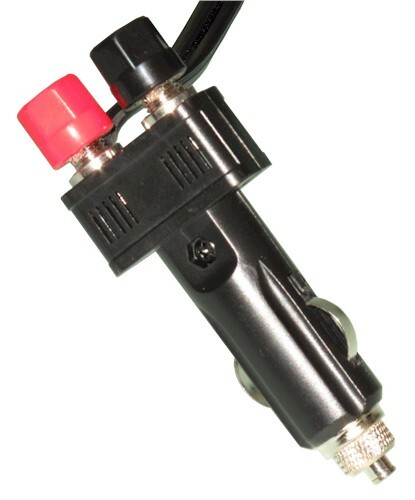 The Speed Dial adapter fits into any portable drill. Place the claws of the adapter over the leveling screw handle and use the drill to quickly turn the screw up or down as necessary to level your Wheeley Bars. This product changes the standard leveling screws (1/2" diameter) to the large leveling screws (5/8" diameter) on Large Size and HEAVY DUTY Medium Size Universal Wheeley Bars which normally come with the smaller screws. * If you simply wish to purchase the Wheeley Bars with the large leveling screws, pick the "upgrade at time of purchase" option (part number TPWLLSUPG). With this option the larger bolt is welded to the leg. ** If you wish to convert from small leveling screws to large leveling screws after the original purchase, use the "purchased separately" option (part number TPWLLS). See pictures and comments below. A closer view of one of the legs of the above setup. 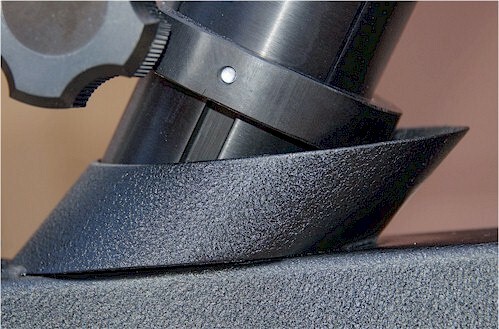 A close-up view of the Losmandy HD Tripod leg inserted into the JMI Wheeley Bar receptacle in the above setup. This picture, supplied by JMI customer Russ De Riso, shows the 10" Pneumatic Wheels in action. Russ says, "This is great - I can move the 80 lb rig like magic." 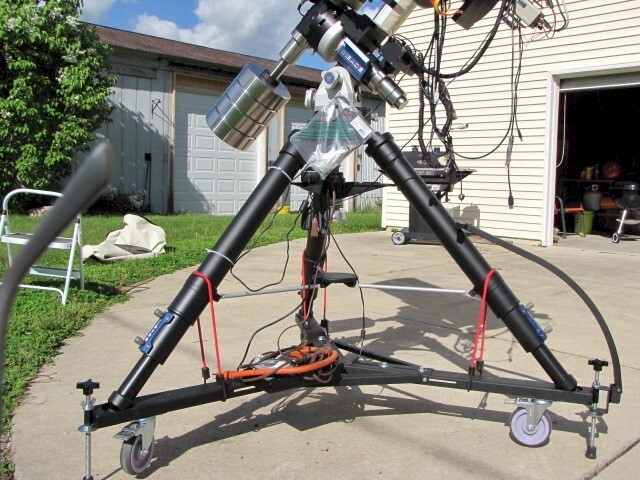 This picture, by customer David Haworth, shows his Astro-Physics Pier Mount on JMI's Large Size Universal Wheeley Bars. 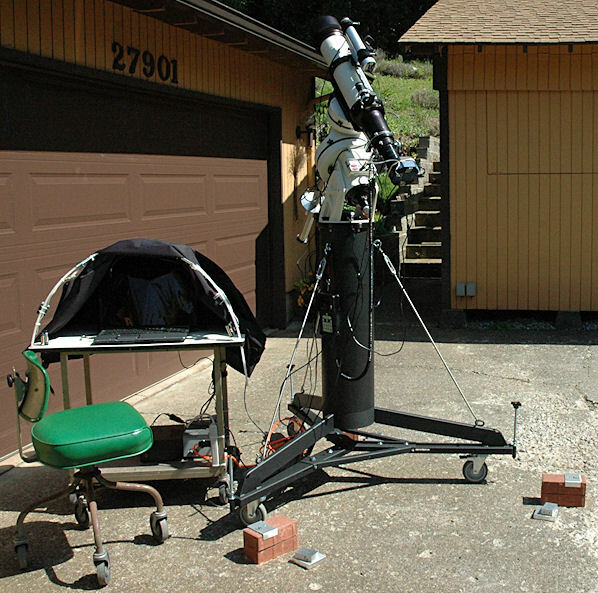 See his setup and more at www.stargazing.net/david/QSI/QSI532NP127is.html. "THE RIDE" shown here includes Large Size Universal Wheeley Bars, the 10" Large Wheel Upgrade (which includes a tow handle), the Motor Upgrade (which includes the Battery Pack Holder) and Orion's Dynamo Pro 17 Power Station (no longer sold by JMI, see the Cen-Tech 12v 17Ah Power Pack). The dual inboard wheels on each rear "axle" help keep a narrow profile. This picture shows the Medium Size Universal Wheeley Bars under a Meade Starfinder Pier Mount. Special adapters are included for the Starfinder mount. 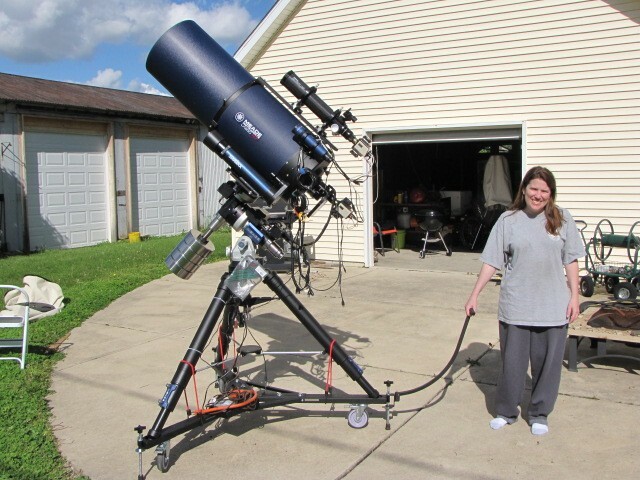 Do you wish you had an easy way to move your tripod-mounted, pier-mounted or Dobsonian telescope from garage to patio or driveway? 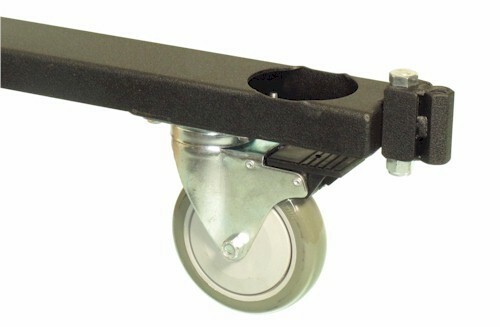 Wheeley Bars (telescope wheels/dolly) were created for just that purpose. 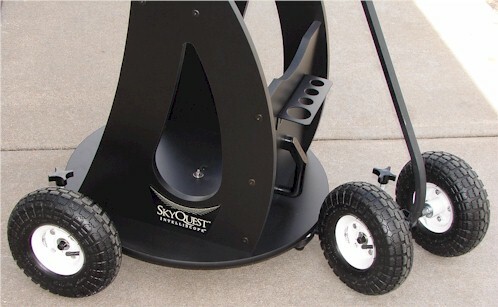 The sturdy base with locking wheels and leveling bolts allows you to easily move, lock, level and use the complete telescope assembly. And best of all, you don't have to disconnect and reconnect all the electrical and computer cabling. Standard Wheeley Bars are designed to be used on hard flat surfaces only. With the optional large-wheel upgrade, great care in maneuvering and ideal conditions, they can be used on grass, dirt and gravel surfaces. 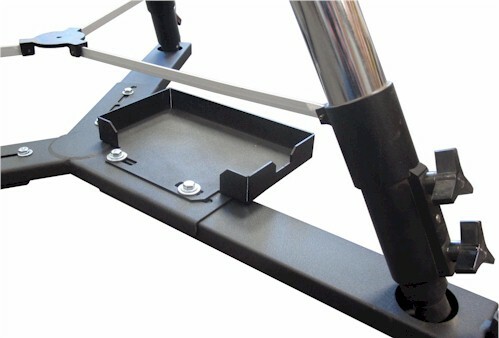 Wheeley Bars are generally designed to be used with the tripod legs almost fully retracted to reduce the overall width. To be sure that your tripod or pier will fit a particular Wheeley Bar product, it may be necessary to verify the tip-to-tip distance of the mount. 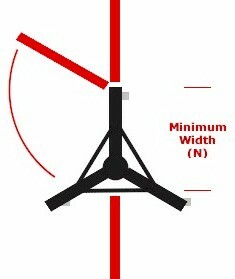 Usually, this measurement is made with the legs of a tripod fully retracted (the shortest length) and spread out completely. Alternately, you can measure at your preferred viewing height, but be sure to allow for the height of the Wheeley Bars (listed with each product). 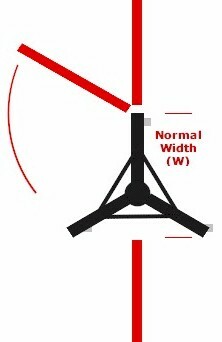 The tip-to-tip distance is the measurement from the outside edge of the end of a tripod leg or pier foot (where it touches the ground) to the outside edge of another tripod leg or pier foot as illustrated below. 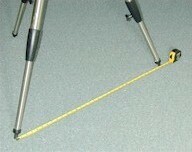 Here are some examples of different types of tripods and piers and where to measure. We often get questions regarding the width of our Wheeley Bars to determine if they will fit through a particular doorway. The following information should help in making that determination. 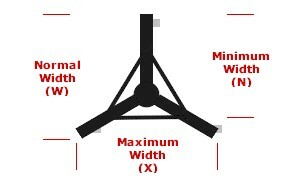 The following dimensions do not apply to Wheeley Bars that have been upgraded with 10" large wheels. For Universal Wheeley Bars with the 10" Large Wheel Upgrade the doorway width must be three (3) inches wider than the tip-to-tip distance. There are three basic measurements as noted above. 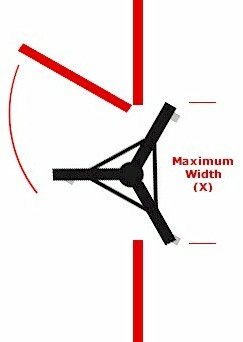 The maximum width (X) is measured in a similar fashion as the tip-to-tip distance except that the measurement is made to the outside corner of the legs or leveling screws (typically about 3" wider than the tip-to-tip measurement of a pointed tip tripod mount). The minimum measurement (N) is from the end of one leg to the inside measurement on the opposite side. This would help in determining the narrowest door that the Wheeley Bars could possibly be maneuvered through. A third measurement (W) is in between the other two and gives the width as measured from the end of one leg to the outside measurement of the opposite side. The diagrams below illustrate the three measurements. The illustration on the left shows the Universal Wheeley Bars turned so they can be pushed through the doorway based on the NORMAL width (W) without having to do any special maneuvering. The second illustration shows the Universal Wheeley Bars being maneuvered by twisting them through the doorway based on the absolute MINIMUM dimension (N). The third illustration shows the Wheeley Bars being blocked from moving though a doorway because they are positioned such that the MAXIMUM profile (X) is being presented. 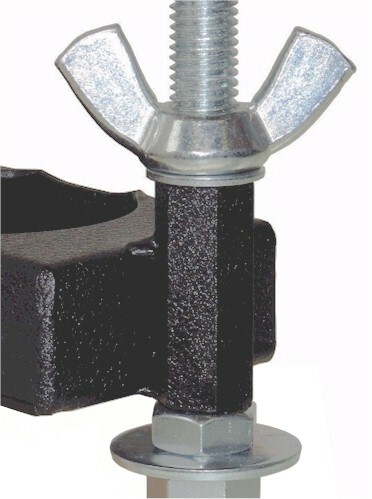 Universal Wheeley Bars are called Universal because they are made to be adjustable to handle various sizes of mounts. This means that the measurement we have been talking about can vary depending on the in-out adjustment of the Wheeley Bar legs. The table below shows the minimum and maximum for the different widths indicated by the variable W, N and X. Medium 32" 36" 22.625" 25.625" 36" 41"
Medium HD 33" 40" 29" 34" 38" 47"
Large 44.75" 49.75" 36.5" 40" 50.5" 56.5"
The small 2-3/8" hard-rubber wheels are good for flat hard surfaces with no cracks or grooves. For hard surfaces, such as concrete sidewalks, with seams or cracks, the 5" polyurethane wheels are best. The large 10" all-terrain pneumatic rubber-tire wheels are designed for field use on rough surfaces such as grass, dirt and gravel. However, great care must be taken in maneuvering on these surfaces, particularly when wet, because the wheels may sink below the surface. We do not recommend using Wheeley Bars on these surfaces under adverse conditions, especially if you have a very heavy telescope. 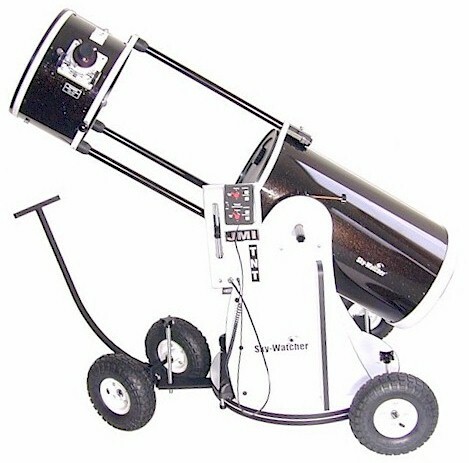 Dobsonian telescopes should use one of our Dob-style Wheeley Bars based on which Dob you have. 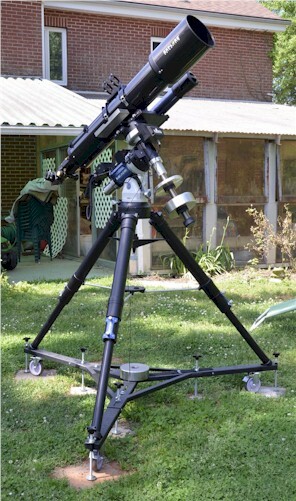 Telescopes with a tripod should use one of the Universal-style Wheeley Bars. 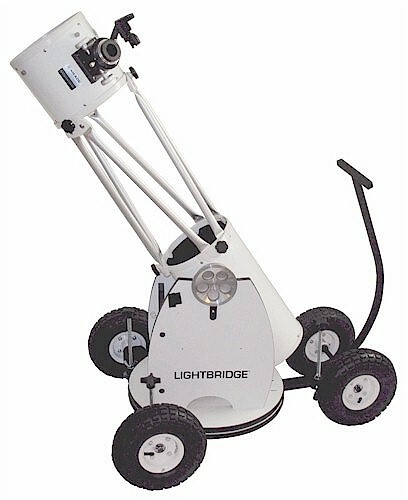 The size will depend on the size and weight of the telescope equipment (see below). 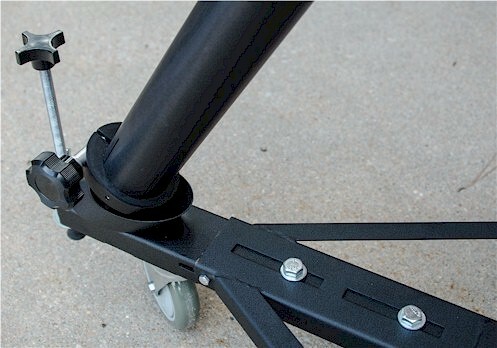 The Universal-style Wheeley Bars show a minimum and maximum tip-to-tip distance for the tripod legs. The best way to measure the tip-to-tip distance is to set your telescope up the way you would normally use it then measure the distance between two tripod feet. Be sure to account for the height the Wheeley Bars will lift your equipment off of the ground. Compare that measurement with the range shown for each size of Universal Wheeley Bars to match up with the best fit. Custom Wheeley Bars are available for those that fall outside of all of the listed ranges. For more information on how to make this measurement, see What is Tip-to-Tip Distance? If you wish to move your telescope equipment through a doorway, see Doorway Measurements to verify whether you will be able to maneuver your equipment through a particular doorway (based on the size of the Universal Wheeley Bars). The Medium Size Universal Wheeley Bars are for small, lighter telescopes like a standard C8 that weighs less than 100 pounds. If you have a telescope with tip-to-tip distance that falls into the Medium range but weighs near or over 100 pounds (total weight of all equipment) you should use the HEAVY DUTY Medium Wheeley Bars since they will support the weight much better. If you are planning on adding any equipment to your telescope in the future (like cameras, guide scopes, etc.) you should take that weight into consideration. 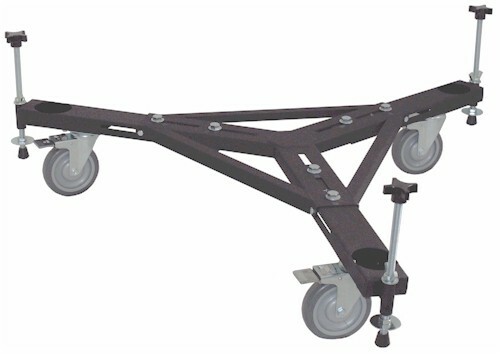 Heavy Duty Medium, Large and Custom Wheeley Bars can carry up to 300 pounds. We also carry Extra Large and Max Wheeley Bars for specific very large telescopes. 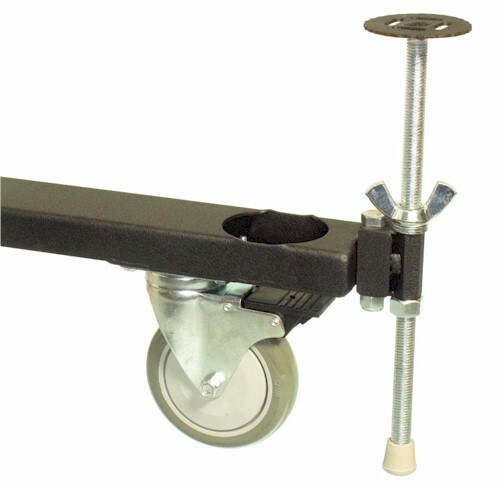 The standard 2-3/8" wheels work fine if the surface is hard and flat, such as a gymnasium floor or smooth concrete. 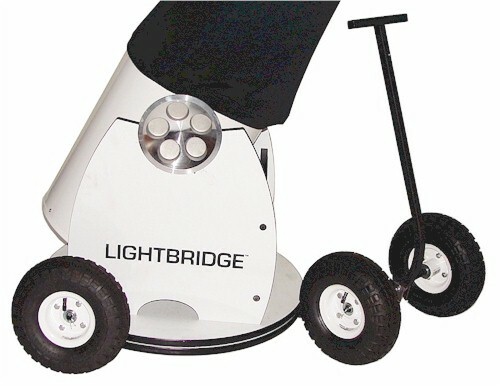 If you need to move over concrete with cracks or seams (like sidewalks and driveways) or rough cobblestone-like surfaces, you should get the 5" Wheel Upgrade as these will ride over these surfaces much better without getting stuck. 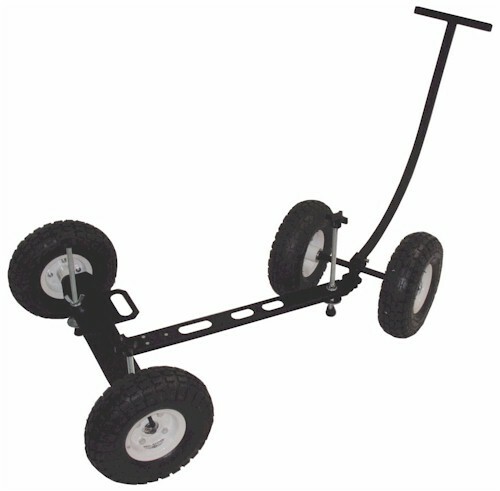 If moving over grass, dirt or gravel (or you just want a smoother ride) you should use the 10" Pneumatic Wheels. 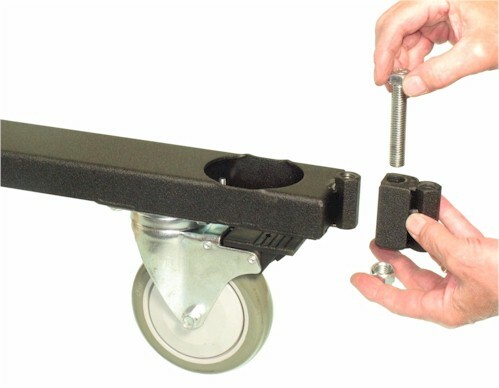 These wheels will travel over surfaces smoothly and not sink into cracks. 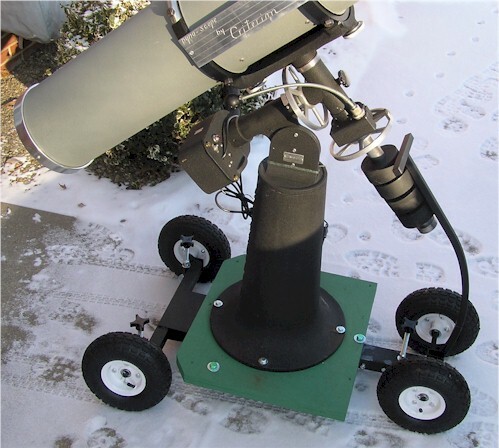 There are times when the 5" wheels can be used on hard dirt, but if the weight of the telescope is more than 100 pounds, the 5" wheels may dig into the upper layer of dirt and become hard to move. For more information on the composition of the different wheels, see What Size Wheels Should I Purchase? We do not recommend using Wheeley Bars on any surface under adverse conditions, especially if you have a very heavy telescope. The heavier the telescope mounted on the Wheeley Bars, the more careful one must be in moving the complete system by pulling or pushing below the center of gravity. JMI is not responsible for incorrect loading or operation. Q. How can I be sure that a particular model will fit my tripod mount? A. First, make sure the legs on your tripod are fully retracted (i.e. set as short as possible). Measure the distance from the tip of one leg to the tip of the next. 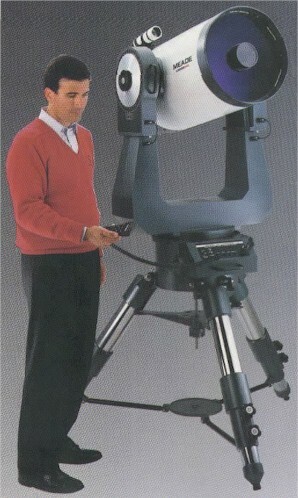 Compare this distance with the specifications shown for the model designed for your tripod. The receptacles that accept the tripod legs are designed for the width and style of tips on your tripod legs. 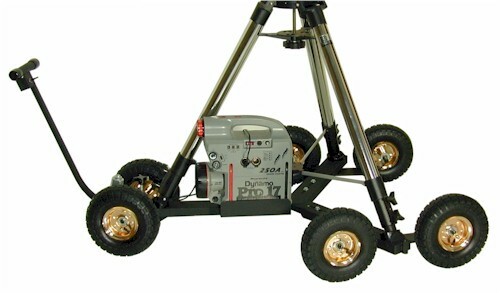 If you do not see your particular model of tripod listed, we may be able to build a custom unit. You will need to give us specific information on tip-to-tip distance (with legs fully retracted), leg diameter and tip style. Q. 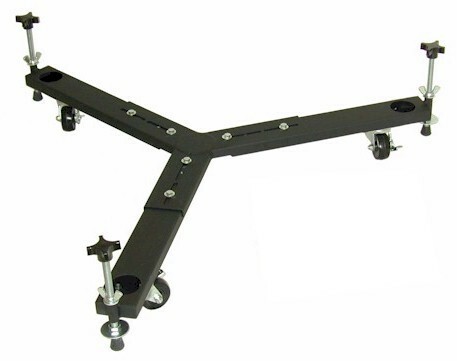 Why are the Wheeley Bars designed to be used with the tripod legs fully retracted? A. For stability and to allow movement of the telescope through a doorway. In most cases this height will be acceptable for normal use. Q. 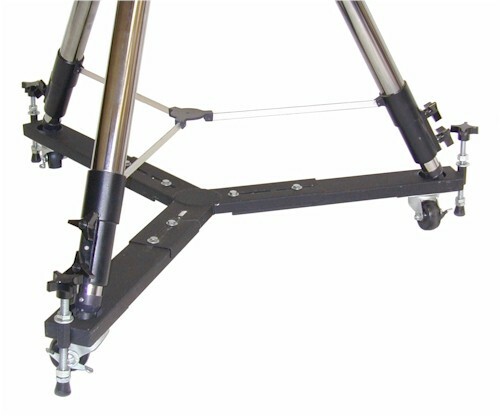 How do the legs of the tripod fit into the Wheeley Bars? A. Generally, they rest inside a hole as large as, or larger than, the width of the tripod tip. Once inserted, you can extend the legs slightly until the tips are snug in their receptacles. Q. 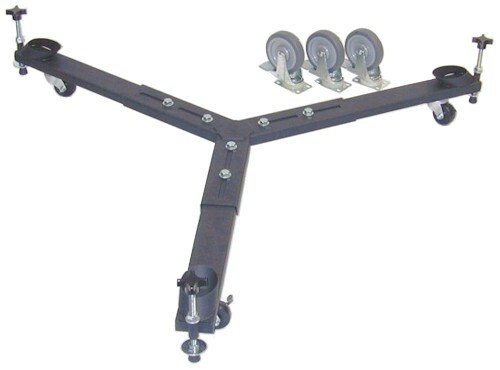 How much will the Wheeley Bars elevate my telescope and mount above the ground? A. That information is given in the description for each model. Large wheel upgrades include information on how they affect the height. Q. 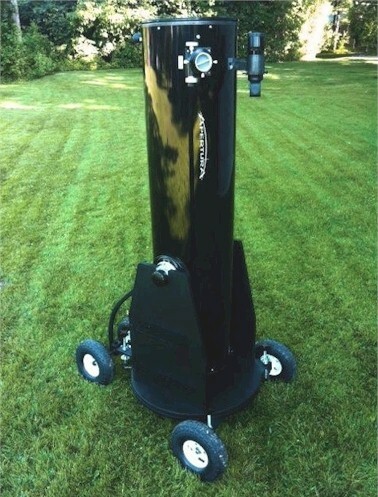 Can I use Wheeley Bars to move my telescope over grass? A. 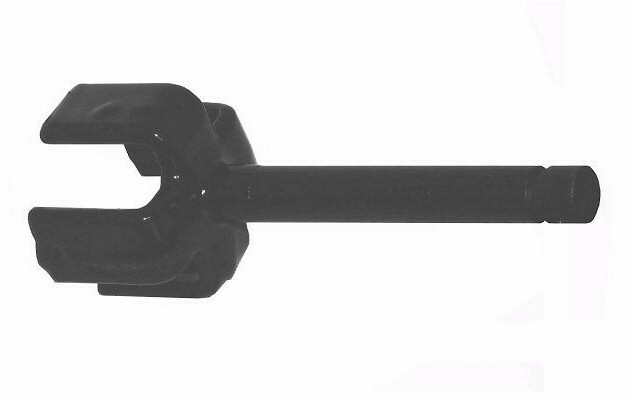 The original Wheeley Bars were designed for use on hard surfaces only. Some customers have stated that they are able to use them on grass but we do not recommend it. Our 5" Large Wheels will work on smooth grass surfaces. With the 10" Pneumatic Large Wheels, great care in maneuvering and ideal conditions, Wheeley Bars can be used on grass, dirt and gravel surfaces. Q. Can I get information on the wheels used on your Wheeley Bars? A. The standard hard-rubber wheel is 2-3/8" in diameter and 1-1/8" in width. An upgrade to large 5" diameter polyurethane wheels is available. These tow sizes are lockable to keep them from rolling when not using the leveling bolts. 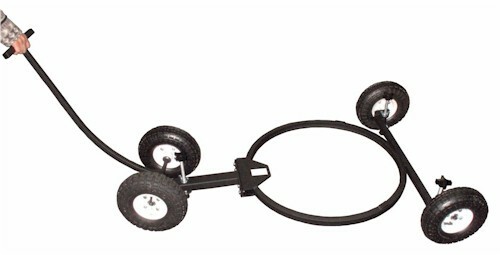 A 10" Pneumatic rubber all-terrain wheel is also available. See What Size Wheels Should I Purchase? Q. What material are the Wheeley Bars made of? A. They are made from sturdy steel channel or rectangular tubing covered by durable black-wrinkle paint. If treated properly, they should last several lifetimes.